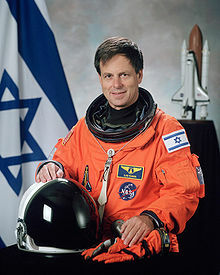 Colonel Ilan Ramon (Hebrew: אילן רמון‎, born Ilan Wolferman; June 20, 1954 - February 1, 2003) was an Israeli air force pilot and the only Israeli astronaut, and a national hero. He was a member of STS-107 mission crew and he died during Space Shuttle Columbia disaster in 2003. His mother was a holocaust survivor (at Auschwitz concentration camp) and his father fought for Israeli independence. Ramon was married to activist Rona Ramon. Wikimedia Commons has media related to Ilan Ramon. This page was last changed on 20 December 2018, at 03:09.